Many consumers are aware that you can save money if you purchase airline tickets on a certain day, or products at a particular time of the year. 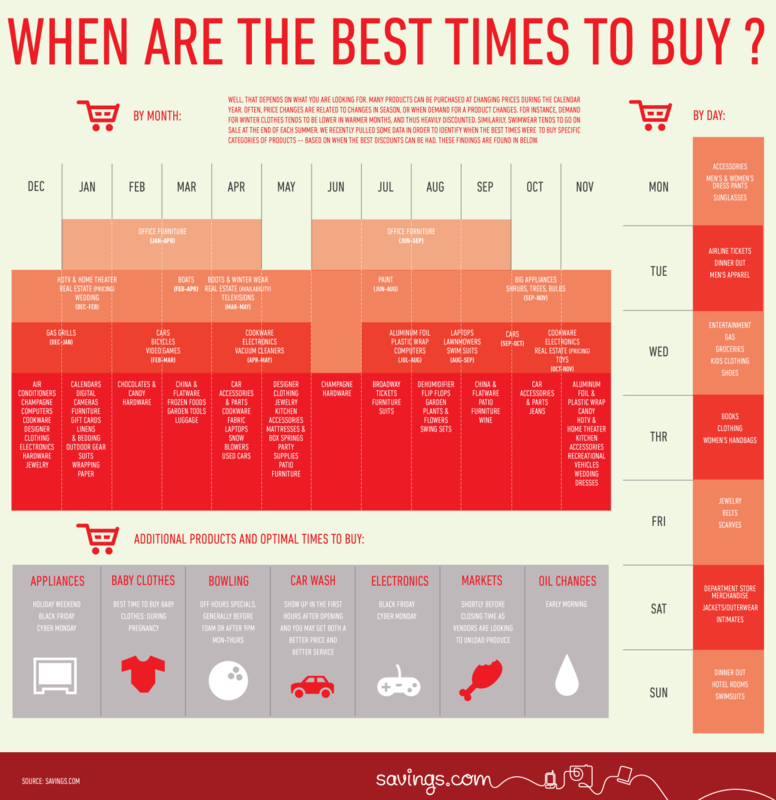 This new infographic from Savings.com lays out the best time to buy airline tickets, as well as many other things like appliances, electronics, and baby clothes. Over the last few years, the economy has been quite rocky, so it has turned many consumers into deal hunters. Having this handy chart at your ready will be very useful if you plan on saving money on flights or gifts during the upcoming holiday shopping season. When it comes to buying airline tickets, the Savings.com infographic states that Tuesdays are the best day to get a great deal. Many other sources confirm this finding, but it is not 100% clear as to why this is the best day. If you are looking for appliances or electronics, then your best options are coming up soon, as Black Friday and Cyber Monday look to be the prime time to get a killer deal. Overall this is a concise and helpful infographic, that could actually be referenced throughout the year. However some of the text, especially the text in red, is not that easy to read. This might be because of the color scheme, or that fact that everything is in CAPS, either way this would be the only minor critique.